And fought for the heavens. 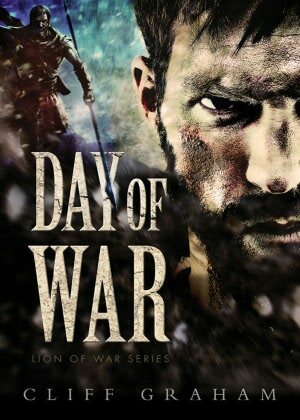 With Day of War, author Cliff Graham introduces the Lion of War Series— five books telling the story of the warlord David and his Mighty Men who are told about in the Bible. I read this book in about four days– the average time for me to read a book that I find to be very good. I highly recommend that some of you pick it up and jump into the world of Ancient Israel. Graham has written a fast-paced novel that combines Biblical characters and events together in a way that the accounts of these men feel more than just something from a history book. We are introduced to a man named Benaiah who has joined David’s army of thieves and outcasts. Throughout the novel, he is the main character and we follow him everywhere. From a fight with multiple lions and a demon to an attack on an Amalekite camp. Unlike some other books, I was excited to get back to Benaiah’s point of view when we followed someone else. Graham doesn’t give us much of a respite in the action. Each chapter begged me to keep on reading, promising me that there was even more battles and intensity. The author intends this series to be directed towards men, that much is obvious. I appreciated that Graham gives the Mighty Men the trials and temptations that many men face today. The only thing that I found wrong– which doesn’t even seem like the right word– is that I felt like there could be more description of the terrain of Ancient Israel. There was enough description to let me imagine I was there, but more detail in the other books would be wonderful. A warning before you pick this one up: It is violent, and is meant for mature audiences. David and his men were not very clean. There is fighting, there is blood, and there is death. For me, however, this did not prevent me from diving right into the first book of Cliff Graham’s first book of what is sure to be an amazing series. The second book, Covenant of War, releases next month. I will be sure to get a copy. Note: I received this book from the publisher in exchange for an honest review. All thoughts and opinions are mine.